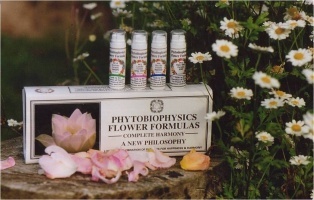 Flower Formulas 1 - such as Lotus vibrate on white energy and are referred to as star formulas, they enhance the effect of all other flower formulas. This flower formula contains the essence of 4 flowers: lotus blossom, shepherds purse, common horsetail and narcissus. Flower Formula 3 - Pink Camellia contains 6 ingredients that all vibrate on a frequency of ultra violet light. The energy of ultra Violet flowers is valuable for treating spiritual and emotional trauma as well as hyperactivity. Ultra Violet flowers antidote the toxic effects of chemicals that become trapped in the brain. They have a calming effect on the brain and help to alleviate descending spiritual pain. Ultra Violet flowers are valuable for alleviating the trauma of operations and wounds since they stimulate the body's own innate ability to heal and produce brain hormones such as encephalon, endorphin and p-factor. Flower Formula 4 - Thistle is a combination of 5 different flowers: Thistle, Azalea, Foxglove, Lavender and Pink Thrift. Thistle is a strong and upright flower and this formula helps to create relaxation and allows one to think clearly in emergencies. It is a calming formula and can help to protect from nervous breakdown and harmonises people when they are overpowered by responsibility and loss of assets. Flower Formula 5 - Nightshade contains a combination of 4 different flowers black nightshade, elderflower, maritime campion and alium. The nightshade family of flowers holds a special place in healing since it is the family that provides many vegetable foods such as tomato and potato. These foods are responsible for enabling the body to ward off bacteria attack. They nourish the body and enable the production of a vital co-enzyme ubiquinone, sometimes referred to as co enzyme Q10 which is essential for the transport of oxygen. Depletion of this vital enzyme can lead to bacterial conditions and cancer. the first structural area of the body to manifest bacterial decay is the teeth. Flower Formula 6 - Phacelia is a combination of 5 different flowers Phacelia, Maritime Campion, White Valerian, Elderflower and Borage. Phacelia is very beautiful flower which energises the land. When the body is under attack from bacteria and pollution, the sinuses and tonsils activate as a first line of defence. Increased atmospheric pollution causes congestion, which leads to pain and discomfort. Phecelia activates the sinuses and enables them to eliminate the atmospheric pollutants that cause irritatation and inflammation. Flower Formula 7 - Orchid contains a combination of Orchid, Dead Nettle, Blue Iris and Frangepane. FF7 Orchid ensures a healthy gut flora through promoting alkalinity in the digestive tract, thereby enhancing the activity of acidophilus and allowing a healthy growth of lactobacillus. FF7 orchid can aid the assimilation of Vit paba and amino-acids l-methionine, l-histidine and glutamic acid. Orchid eases frustration and stress when we have become over sensitive, dramatic, depressed and tormented by anguish, self-doubt and feeling of inadequacy. Flower Formula 8 - Rosemary has the essence of 4 different flowers Rosemary, Sage Dead Nettle and Strawberry Flower. Indigo flowers promote a feeling of joy and pleasure. Depression is caused by sedation of the autonomic nervous system which is often associated with metal toxicity and chemicals which sedate the nervous system. When these harmful toxins are eliminated the autonomic system will function in harmony and depression will lift. FF8 rosemary can aid the assimilation of Vit a/d and amino acids l-tryptophan and l-histidine. FF8 rosemary can aid the digestion of essential fatty acids such as oil of evening primrose and fish oils. Flower Formula 9 - Bluebell contains a combination of the following essences Bluebell, Borage, Speedwell, White Valerian and Wild Succory. Blue flowers stabilise all conditions of the throat and antidote the effects of radiation. Blue resonates on the frequency of the thyroid hormones and therefore affects the digestive system and the temperature regulation of the body. Blue also stabilises the parathyroid production of calcitonin and parathormone which play a vital role in the structure of the skeleton and bones by maintaining calcium and magnesium levels. FF9 bluebell can aid the digestion of milk and the assimilation of calcium and magnesium from vegetables and seeds. FF9 bluebell can aid the assimilation of amino acids l- tryptophan, l-histidine and l-proline and minerals iodine, selenium, calcium and magnesium. Flower Formula 10 - Nicotiana has 10 flower essence ingredients Nicotiana, Bay Flower, Bramble, Cow parsley, Pennnywort, Common Horsetail. FF10 nicotiana can aid the assimilation of B2 and the amino-acids l-isoleucine and l-leucine and l-glycine. Flower Formula 11 - Hawthorn is a natural remedy containing the essences of 6 flowers Hawthorn Blossom: Fat Hen, Chickweed, Ivy flower, Lily of the Valley and the Snowdrop. FF11 Hawthorn formula can aid the assimilation of Vitamin e and amino acids l-methionine l-carnitine glumatic acid. This Hawthorn natural remedy can also aid the digestion of wholegrain, nuts and seeds. It also aids the functionality of a healthy heart and encourages DNA repair. Flower Formula 12 - Dandelion is a natural remedy using flowers that vibrate together at a frequency of 580 nm which is yellow to the human eye. The formula contains the essences of Dandelion, Fennel, Hawkweed, Wild cabbage and Pineapplewort. Flower Formula 13 - Evening Primrose is a natural remedy that vibrates on a light frequency of 572nm which is yellow. This formula contains the essences of Evening Primrose, Black Medick, Butchers Broom and Fumitory. Evening Primrose formula can aid the assimilation of all Vitamins and amino acids l-methionine and l-ornithine. FF13 Evening Primrose formula can aid the digestion of liquids. Flower Formula 14 - Daffodil is a natural remedy that vibrates on a colour frequency of 568nm - this is the colour of yellow. There are 4 different flower essences in FF14 including Daffodil, St.John's Wort, Black Medick and Narcissus. Yellow flowers harmonise fearfulness, spiritual and emotional wounds and therefore speed up the healing process. Flower Formula 14 Daffodil can aid the assimilation of all Vitamin a, a/d and beta carotene and amino acids l-threonine, l-tryptophan and l-tyrosine. It is a fantastic support for the skin. Our Daffodil formula can also assist with the metabolism of gluten. Flower Formula 15 - Yellow Foxglove vibrates on a colour frequency of 574nm and consequently is yellow in colour. This natural remedy contains the essences of 5 different flowers Yellow Foxglove, Bird's Foot, Trefoil, Buttercup, Wild Cabbage and Yew. Yellow Foxglove natural remedy can be effective for labour pains as it triggers the brain to secrete hormones, which make the baby safe when it is born ie they ensure the baby has as cushioned a birth as possible by reducing the shock and pain of being born. It is also helpful for Crohn's disease which is a form of internal eczema where there is a breakdown of pancreatic enzymes and non-assimilation by the bowel resulting in a complete breakdown. Flower Formula 16 - Daisy vibrates on a colour frequency of 615nm which is orange. This natural remedy has the essences of 4 different flowers Daisy, Camomile, Marigold, and Nettle. Our Daisy Flower Formula helps with the assimilation of Vitamin folic acid, mineral magnesium and amino acids l- phenylalanine, l-carnitine. It is effective for a range of concerns experienced during puberty, childbirth or the menopause. Flower Formula 17 - Arum Lily is a Natural Remedy that vibrates on a colour frequency of 605nm which is orange in colour. This flower formula contains the essence of 4 different flowers: Arum Lily, Storksbill, Marigold and Acorn. This Arum Lily formula can aid the assimilation of vitamin B6, mineral calcium and amino acids: l-phenylalanine, l- carnitine and l-glycine. Flower Formula 17 can assist in the case of a hysterectomy: The uterus produces HCG, which is responsible for keeping the placenta healthy, enabling the fertilised egg to fix itself in the wall of the uterus and it is vital for keeping women alive and well after the menopause. Flower Formula 18 - Poppy is a natural remedy that vibrates on a colour frequency of 660nm which is red. This flower formula contains the essences of 4 different flowers Poppy, Hibiscus, Scarlet Pimpernel and Red Tulip. Red flowers promote healthy red blood cells. the blood circulation affects the function of all the vital organs. Poppy formula can aid the assimilation of vitamins B1 and D, minerals copper and iron and amino acids: l-leucine, l-lysine and glumatic acid. Flower Formula 19 - Red Chrysanthemum is a fantastic natural remedy that vibrates on the colour frequency of 670nm, which is red. This plant remedy contains the essence of 5 different flowers Red Chrysanthemum, Ribwort, Plantain, Red Shank and Red Ixora. Flower formula 19 can be a successful treatment for bacteria dysentry tooth decay. If there is bacteria in the mouth, then there will be bacteria in the rest of the body. What happens in the mouth, always manifests in the colon. FF19 red chrysanthemum formula can aid the assimilation of Vitamins: choline and inositol, all minerals and amino acids: l-leucine, l-lysine, l-proline and l-glutamine. Flower Formula 20 - Red Anemone is a natural remedy that vibrates on a colour frequency of 770nm which is infra-red to the eye. This plant remedy contains the essences of 5 different flowers: Anemone, Great Willow, Herbwood Woundwort, Comfrey and Figwort. The Red Anemone formula can aid the assimilation of Vitamin B3 nicotinic acid, all minerals and amino acids: l-leucine, l- lysine, l-arginine and l-serine. Flower Formula 20 can be an effective treatment for tetanus. This damages the jawbone and back teeth of the left jaw. Tetanus also damages the wisdom teeth and can stop them from coming through. telp. 021-8444444, Hotline service : 085691843843.